The Pro Star CFL lamp range is bought to you by the same people who make Secret Jardin tents. A dependable, low energy lighting system in a range of wattages to suit your growing need. Blue spectrum CFL are available in 125w, 200w and 300w - This light is generally used for Propagation and Vegetative cycles. Red spectrum CFL Lamps are available in 125w, 200w and 300w variations - this light is best suited to Flowering cycles. The lamps are designed to be low consumption to save energy and produce less heat than Metal Halide and HPS lighting systems. 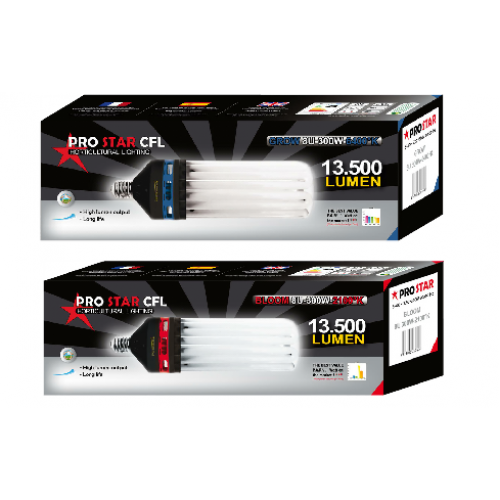 The integrated ballast allows the Pro Star CFL lamps to be connected directly to an E40 lamp holder or Reflector.